2. 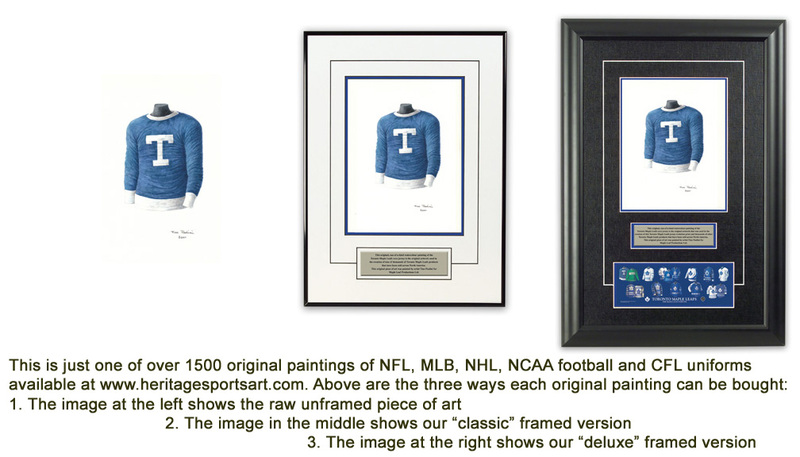 Please note that all of the actual original, one-of-a-kind artwork of the University of Florida football uniforms as seen in the poster above are actually available for sale. These watercolor paintings are truly beautiful, original watercolor paintings, and there are only 13 of them so please act quickly if you would like to buy one. These would make a wonderfully memorable, beautiful and completely unique gift for someone who loves Florida football. 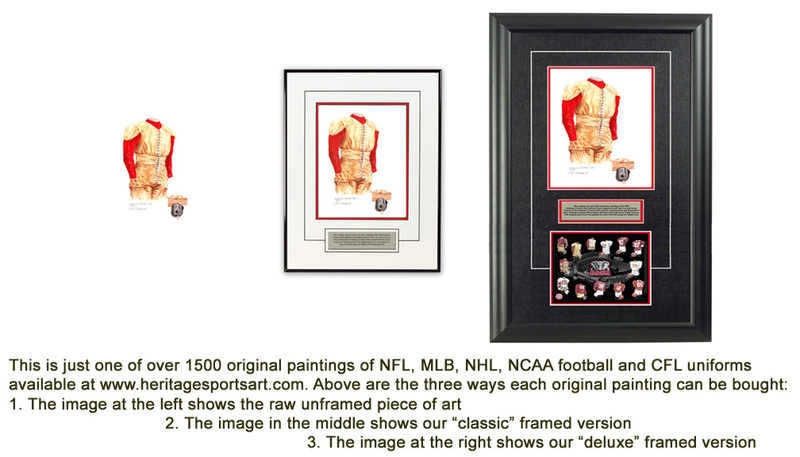 If you would like more information about this great artwork including the three ways you could purchase each piece, please visit our Florida YouTube video at www.youtube.com/watch?v=q8ncHxYgtuw or go directly to the artwork website www.heritagesportsart.com/ Florida-Gators-c82/ where you can see and purchase the artwork. The University of Florida is located in Gainesville, Florida. They played their first game in 1906. The Gators football team plays out of Ben Hill Griffin Stadium at Florida Field ‘The Swamp.’ The stadium accommodates 83,000 spectators and has sold out 109 consecutive games. As of the end of the 2007 season, Florida had a home record of 94-11-0 (.895 winning percentage) at The Swamp. The Gators have captured two National Championships and seven SEC titles in the schools history. Florida boasts an excellent tradition of football success; countless Gators have extended their football careers in the NFL, Arena League and the CFL. Notable Gator alumni include: Steve Spurrier, Jack Youngblood, Cris Collinsworth, Lomas Brown, Emmitt Smith, and Danny Wuerffel. If Florida was nationally ranked in "The Top 20" (or Top 10 in some years) in a particular season depicted in the poster, we show the team’s ranking. That being said, prior to 1936 there was no nationally recognized poll ranking the nation’s top teams, so you will not see any rankings prior to 1936. 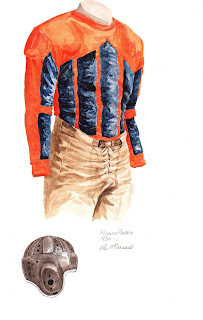 This painting depicts the 1913 University of Florida football team uniform. The 1913 team was coached by G.E. Pyle and the Gators compiled a record of 4-3 including a lopsided 144-0 victory of Southern College. The Alligators were captained by Louis E. Tenny. Gator players in 1913 went helmetless while sporting a light tan vest over a long-sleeved blue shirt with orange stripes. No uniform numbers were present during this period. 1913 marked the eighth season of college football at Gainesville. A star player for the Gators during this period was Back ‘Harvey’ Hester. 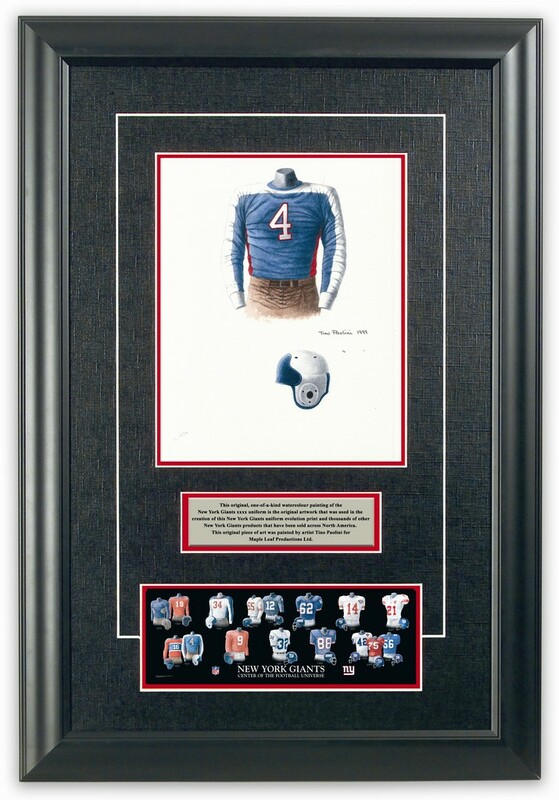 This painting depicts the 1923 University of Florida Gators football team uniform. Gainesville’s footballers compiled a sparkling record of 6-1-2. The 1923 team was coached by Gen. James A. Van Fleet; in only two seasons as Head Coach of the Gators, Van Fleet guided the team to 12 victories against only 3 losses and 4 ties. The ’23 squad was captained by ‘Robbie’ Robinson. 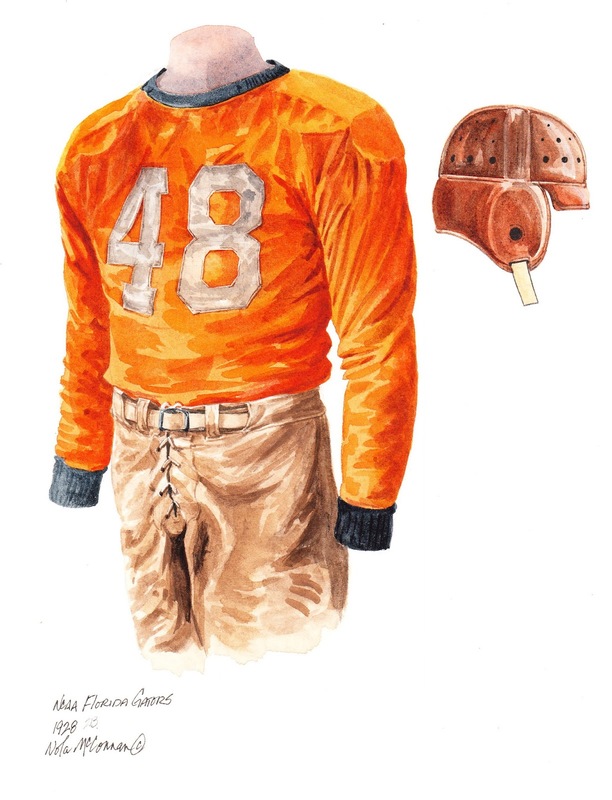 Gator players in 1923 sported a tan-colored helmet. Uniform jerseys were blue with tan-colored vertical markings on the front and sleeves. Numbers appeared on the reverse side of the jersey. Players’ pants were also tan colored. The ‘Orange and Blue’ of 1923 had a brilliant season including a Thanksgiving Day triumph over the University of Florida (16-6). This painting depicts the #48 University of Florida football team uniform from 1928 (player unknown, although it is believed he is an offensive backfield player). 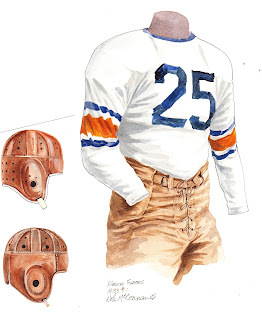 Tide players in 1928 sported orange jerseys with a blue collar and sleeve cuff. Tan uniform numbers appeared on both the front and back of the jerseys. 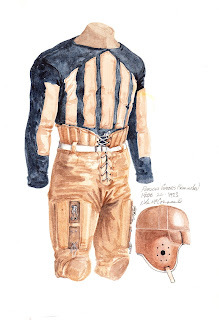 Pants were a similar, tan-color while players wore tan-colored helmet as well. 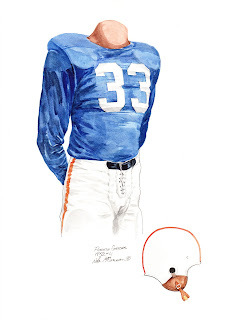 This painting depicts the #25 University of Florida football team uniform from 1933 (player unknown). 1933 was the first year as Head Coach of the University of Florida for D.K. Stanley and he led the Gators to 5-3-1 record. Stanley coached for two more seasons and compiled a 14-13-2 record. The Gators of ’33 were captained by Quarterback Sam Davis (1931-33). Florida’s three losses came to rivals Georgia, Georgia Tech, and Tennessee. Gator players in 1933 sported white, long-sleeved jerseys with blue numbers on both the front and back. The jersey also featured a blue collar with orange and blue markings on the sleeves. Pants were a tan-color while players wore tan-colored helmets as well. W.W. ‘Billy’ Chase played for Florida from 1993-35 and captained the ’35 squad. This painting depicts the 1934 University of Florida football team uniform (player unknown). ‘Dutch’ Stanley returned to coach the Gators in 1934 and led the team to a 6-3-1 record. The team was captained by Charles ‘Chuck’ Rogers (1932-34) and the Saurians defeated fellow SEC foes Auburn (14-7) and Georgia Tech (13-12). The Gators sported orange jerseys with blue, vertical felt markings on the sleeves and front of the jersey. Players wore tan-colored pants and black helmets. 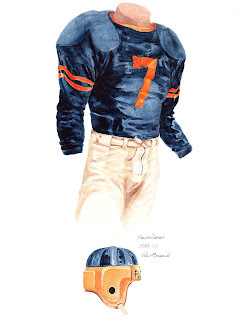 This painting depicts a #7 University of Florida football team uniform from 1944 (player unknown). The 1944 team was coached by Thomas J. Lieb who patrolled the sidelines for the Gators from 1940-42, 1944-45), there was no team in 1943. Under Lieb, Florida managed to go 4-3 in 1944 but played below .500 during his five-year tenure (20-26-1). Right End Joe Graham captained the ’44 Gators. Gator players sported long-sleeved, blue jerseys with two orange stripes above the elbow and orange numbers on both the front and back of the uniform. Players’ helmets were also blue and orange while the pants were white. After a one-year hiatus, the Gators emerged in 1944 to capture four victories in seven games. This painting depicts the #33 University of Florida football team uniform from 1952 that belonged to John ‘Papa’ Hall, the Half Back who starred in the 1953 Gator Bowl win. The 1952 Gators posted an impressive 8 and 3 record including a 14-13 victory in the Gator Bowl versus Tulsa on January 2, 1953. In 1950, Bob Woodruff began a 10-year head coaching tenure at Gainesville and compiled a 53-42-6 record before passing the torch to Ray Graves. Charlie LaPradd, who was an Army paratrooper prior to resuming his collegiate career, was selected as a First Team All-America in 1952. LaPradd played on both sides of the ball but excelled as an Offensive Tackle; he was also a co-captain of the Gators along with Bubba Ware. The University of Florida Gators of 1952 sported solid blue jerseys with white numerals on both the front and back. Players wore white pants and white helmets with a single orange stripe. The Gators had a dramatic ’53 Gator Bowl victory over Tulsa (14-13). 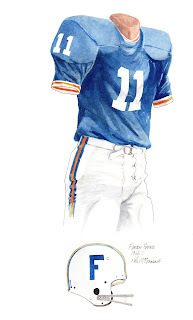 This painting depicts the famous #11 University of Florida Gators football uniform of Quarterback Steve Spurrier from 1966. Spurrier became the first Gator to capture College Football’s Heisman Trophy in 1966 while also garnering First Team All-America status in both ’65 and ’66. He was inducted into the College Football Hall of Fame in 1986. Here’s what our friends at Wikipedia have to say about Steve Spurrier. Ray Graves was the Head Coach of the Gators during the entire decade of the 1960’s and compiled an impressive record of 70-31-4 including a 9-2 season in 1966. 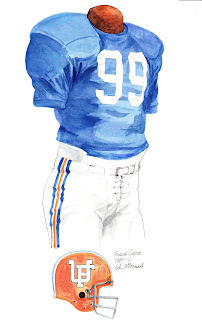 The Gators of 1966 wore blue jerseys with sleeves to the elbow. White and orange piping on the collar and sleeve cuffs distinguished these uniforms along with the players’ numeral on each shoulder. White numbers also appeared on the front and back. Players sported white helmets with a blue stripe and blue F on each side. Pants were white with blue and orange markings down each side. In 1976, Green was selected in the first round of the NFL Draft by the Seattle Seahawks; he played five seasons in the NFL. Here’s what our friends at Wikipedia have to say about Sammy Green. Doug Dickey took over for Ray Graves as Head Coach of the Gators in 1970 and coached until 1978. Dickey compiled a 58-43-2 record while carrying the clipboard for Florida. The Gators were captained by Sammy Green and Jimmy DuBose. The ’75 Gators won nine games and lost only three including a 13-0 loss to Maryland at the December 29, 1975 Gator Bowl. 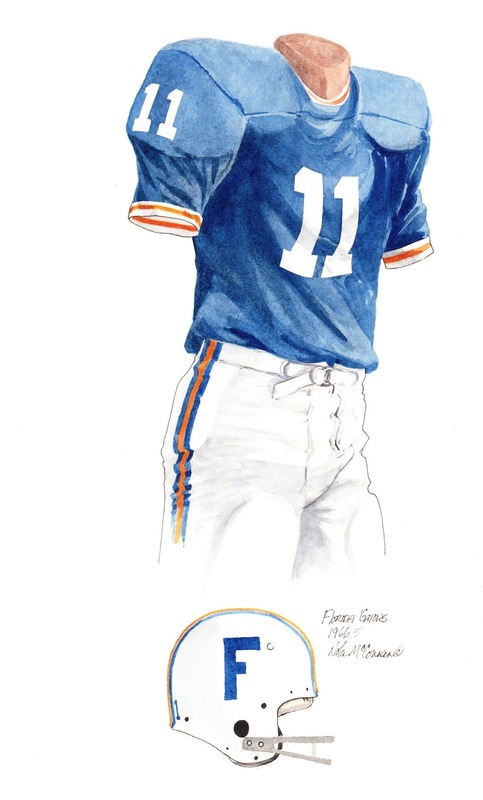 The 1975 Florida Gators uniform included a blue jersey with sleeves to the elbow and numerals on both the front and back. Pants were white with orange and blue stripes down the side of each leg. Helmets were orange with a white UF on each side of the helmet and blue and white stripes on the center of the helmet. In 1985, the Detroit Lions selected Brown in the first round (6th overall); he went on to star in the NFL for 18 years including more than ten years with Lions. Here’s what our friend at Wikipedia have to say about Lomas Brown. Brown, Johnson, and Patrick Miller captained the 1984 squad and led the team to a 9-1-1 record and a #3 final AP ranking. The Sporting News and the New York Times declared the Gators national champions. Charley Pell took over from Doug Dickey as Head Coach of the Gators following the 1978 season and was replaced himself partway through the 1984 season by Galen Hall. Pell managed to lead the squad to 33 wins, 26 losses, and 3 ties. 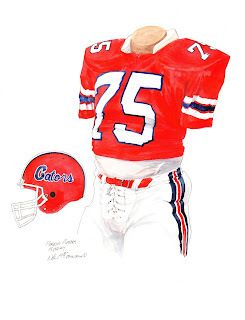 1984 Gator players sported orange jerseys with white and blue stripes on the elbow-length sleeves. White uniform numbers adorned the front, back and shoulders. Pants were white with orange and blue stripes down each side. Helmets now featured a stylized version of the word ‘Gators’ in blue on each side of the orange helmet. White and blue stripes also adorned the helmet. The ’84 Gators included the dynamic Neal Anderson (1982-1985) who rushed for 3,234 in three years with the orange and blue. This painting depicts the #50 University of Florida Gators football uniform of All-American Defensive Tackle - Brad Culpepper. In 1991, Culpepper was the most honored scholar-athlete in the nation; he later graduated from law school. Despite being drafted in the 10th round of the 1992 NFL Draft, Culpepper enjoyed nine successful NFL seasons with the Vikings, Buccaneers, and Bears. Here’s what our friends at Wikipedia have to say about Brad Culpepper. Culpepper, Cal Dixon, and Tim Paulk captained the Gators to 10-2 record under the tutelage of Head Coach Steve Spurrier. Spurrier, who starred for the Gators in the mid-1960’s began his coaching tenure in Gainesville in 1990 and went on to lead the squad until 2001. The Gators compiled a 122-27-1 record under Spurrier. Although having captured the SEC Championship, Florida lost to Notre Dame 39-28 in the Sugar Bowl. 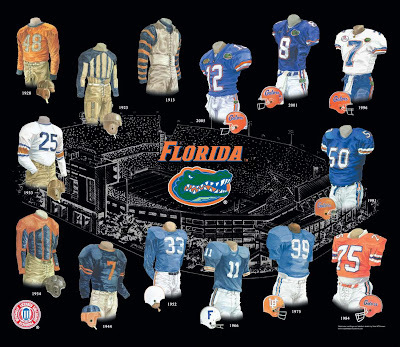 The 1991 University of Florida Gators football uniform consisted of a blue jersey with white numerals on the shoulders, front, and back of the jersey and white and orange stripes on the elbow-length sleeves. The numbers also contained a thin orange tracing. The players’ white pants were adorned with orange and blue stripes down each side. 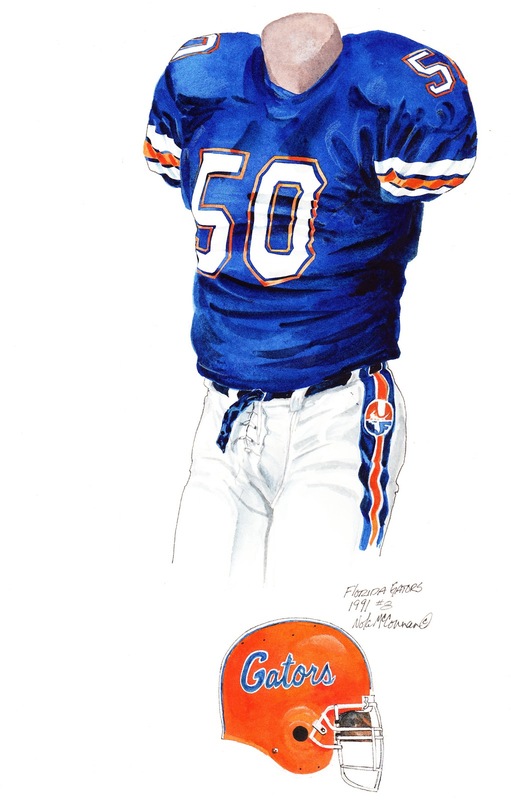 Helmets were orange with a blue, stylized ‘Gators’ on each side and a white and blue stripe down the middle of the helmet. Co-captain Cal Dixon anchored the Offensive Line in 1991. 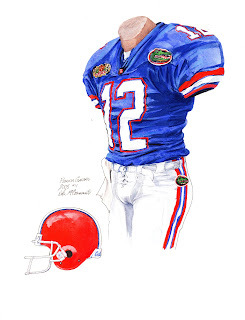 This painting depicts the #7 uniform of University of Florida Gators Quarterback - Danny Wuerffel. 1996 was a magical season in Gainesville as Wuerffel was selected for the second time as an All-American and finished first in Heisman Trophy balloting and the Gators captured the National Championship. Despite a stellar collegiate career, Wuerffel managed six unspectacular seasons of professional football. Here’s what our friends at Wikipedia have to say about Danny Wuerffel. 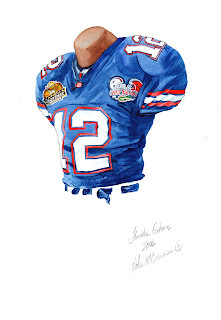 In 2000-01, Wuerffel was ranked as the 37th greatest college football player of all time by College Football News. The ’96 posted a 12-1 record including 52-20 thrashing of previously number one ranked Florida State in the Nokia Sugar Bowl on January 2, 1997. The Gators were led by Head Coach Steve Spurrier whose offence racked up 611 points in only 13 games. Spurrier also led the team to their fourth consecutive SEC Championship. 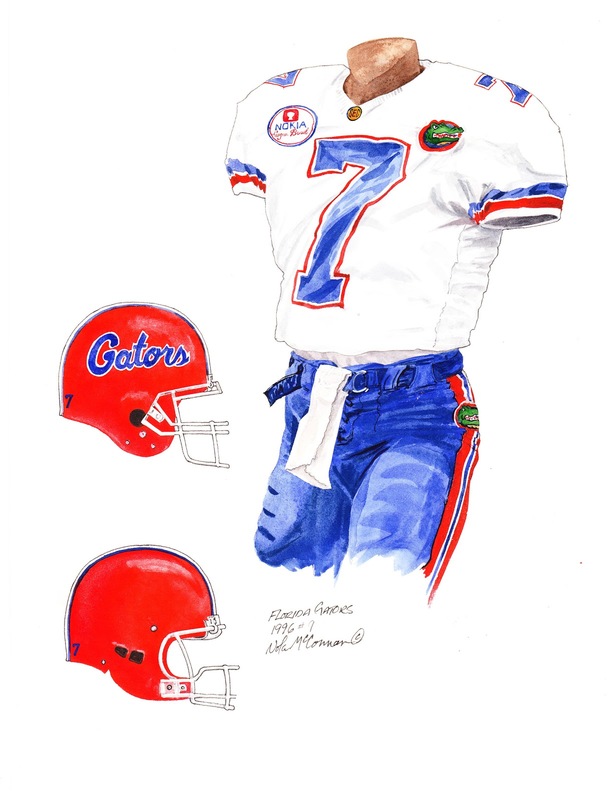 The 1996 University of Florida Gators football team wore both white and blue uniforms; the jersey below consisted of blue numerals with orange tracing on the shoulders, front and back. The sleeves featured an orange and blue stripe. The pants were blue with orange and white stripes. Helmets were orange with a blue, stylized ‘Gators’ on each side and a white and blue stripe down the middle of the helmet. The Gators defeated Florida State 52-20 in the Nokia Sugar Bowl to claim the National Championship. 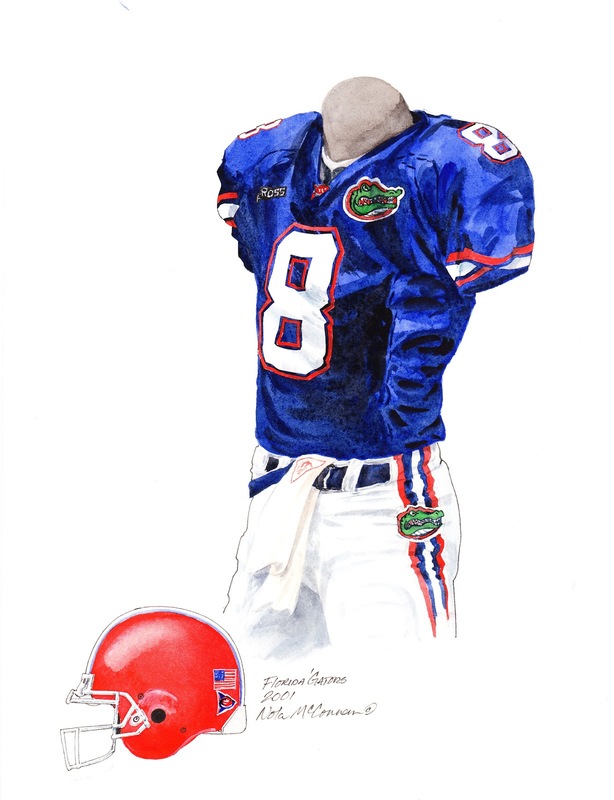 This painting depicts the #8 uniform of University of Florida Gators Quarterback - Rex Grossman from 2001. Grossman earned All-America honors in 2001 and was the runner-up for the Heisman Trophy - only the fifth sophomore to ever rank in the top two of that balloting. Grossman was selected in the first round (22nd overall) by the Chicago Bears in the 2003 NFL Draft. His pro career can be seen here. Here’s what our friends at Wikipedia have to say about Rex Grossman. Under Steve Spurrier, the ’01 Gators won 10 games against only two losses and finished third in the SEC. The 2001 campaign was Spurrier’s last with his beloved Gators; 10 days after resigning his post, he signed on to coach the Washington Redskins of the NFL. In two seasons with the ‘Skins, Spurrier compiled a 12-20 record before moving back to the college ranks and the University of South Carolina Gamecocks. The 2001 University of Florida Gators football team wore both white and blue uniforms; the blue jersey below consisted of white numerals with orange tracing on the shoulders, front and back. A crest of a Gator appeared on the left shoulder; while an ‘A-Ross’ crest appeared on the right shoulder. The sleeves featured orange and white stripes. The pants were white with orange and blue stripes. Helmets were orange with a blue, stylized ‘Gators’ on each side and a white and blue stripe down the middle of the helmet. Rex Grossman led a potent Florida offensive attack in 2001. This painting depicts the #12 uniform of University of Florida Gators Quarterback - Chris Leak from 2006. The team would amass a 13-1 record, en route to winning the National Championship in convincing style - crushing the Ohio State Buckeyes 41-14 in the Tostitos Fiesta Bowl. Leak would finish the contest having completed 25 of 36 passes for 212 yards and a touchdown. His official University of Florida bio can be seen here. Here’s what our friends at Wikipedia have to say about Chris Leak. In 2005, Urban Meyer took over as Head Coach of the Florida Gators and guided the team to a 9-3 record. In 2006, following the BCS Bowl Championship win over Ohio State in the Fiesta Bowl, the University of Florida became the first NCAA Division I-A school to capture the football and men’s basketball national title in the same calendar year. With the victory, Meyer became just the 7th coach in NCAA history to win a National Championship in either his 1st or 2nd season. The 2006 University of Florida Gators football team wore both white and blue uniforms; the blue jersey consisted of white numerals with orange tracing on the shoulders, front and back. A commemorative patch, celebrating 100 years of Florida Gators football, can be seen on the players’ left breast while a Tostitos Fiesta Bowl patch, honoring the team’s participation in the BCS Championship game in Arizona, was eventually placed on the right hand side. An SEC crest appears on the V of the neck. 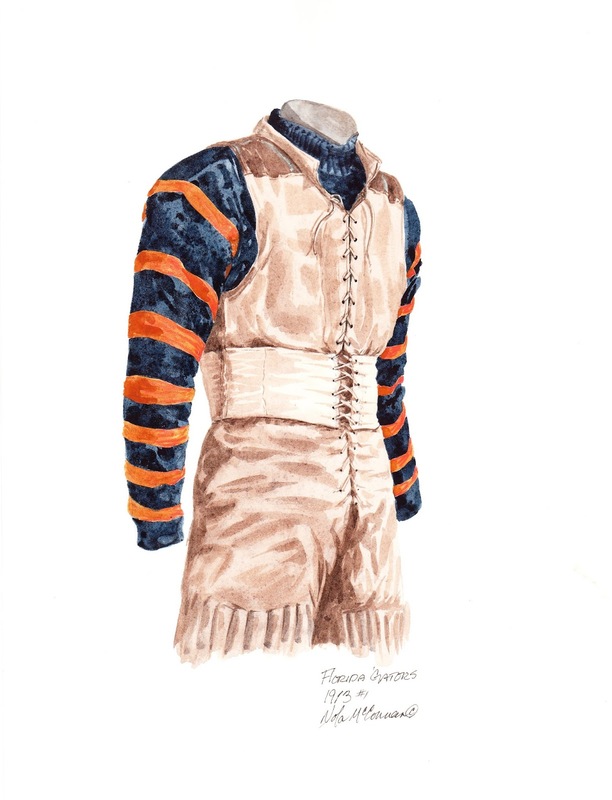 The sleeves featured orange and white stripes and the pants were white with orange and blue stripes. If you love Florida and the history of Gator football, you might really love to own an original piece of artwork celebrating the team's historic uniforms as seen in the poster at the top of this blog - you can actually own one of those original pieces of art! There are only 13 pieces of original art available for sale, and when these 13 are sold, that's it, they're all sold out. 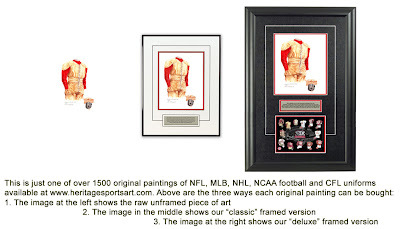 If you would like more information about this great artwork including the three ways you could purchase each piece, please visit our Florida Gators YouTube video at www.youtube.com/watch?v=q8ncHxYgtuw or go directly to the artwork website www.heritagesportsart.com/ Florida-Gators-c82/ where you can see and purchase the artwork.